Yesterday I received the very nice book "Topped Gun - Requiem for the Skyhawk" written by Ross Ewing, a very interesting and in my opinion detailed history on the A-4K in RNZAF. In the last parts I was shocked how Labour Party "raped" the RNZAF and it's defence..... Over here in Europe there has never been much written about the whole thing but the book revealed the whole story, really bad. However, my question is clear and simple..... is there any chance that when another Government comes to NZ the combat squadron(s) will be re-activated??? I also understood that SkyhawkDon is writting another book about the Skyhawk, right? There is a new Govt. It's not going to happen. Yes Topped Gun is a good read and covers the politics of the decison to disband the ACF very well. The book I am assisting write will cover more of the day-to-day life on Squadron and "interesting" events involving the Skyhawks over the last 40 years. Politics will feature, but more to do with the decison to buy Skyhawks in the first place. The sale saga will also get a mention as this is new material since Topped Gun was published. So I guess it will start and end with politics! But the bit in the middle will be quite different to Topped Gun, with a lot more colour photos, many of which have never been seen before by the general public. That is the plan, but like all good plans it is subject to change! I'm looking forward to that book Don. The technical and operational skills required to operate such aircraft were given away free to the RAAF and RAF. That's not to say never tho. Presently it is not on the current government's agenda, but who know's what the future holds. Remember the air force was formed from scratch once before. It'd take significant funds and years of build up to qualify a strike sqn as combat ready, but do-able. At some point the same smaller but slightly larger PDF at 700Mb (for easy archiving on a CDrom) will become available at: www.adf-history.com/ Why was it not at FileFront? Recently FileFront changed the maximum file size from 1GB to 600Mb Maximum. In the spirit of ANZAC co-operation the RAN/FAA PDF does not compete with any RNZAF books about their Skyhawk but it is a complement to the mutual use of the Skyhawk in this region. I have the same way of thinking like you do, who know's what future will bring, it looks like imposible but things can change.... even in NZ! If you think NZ needs an ACF capability then now is your chance to have your say as part of the Defence White Paper review through the public consultation process that is currently going on. Even though National has ruled it out as part of the scope of the review, it should not be so quickly dismissed by the politicians. After all, isn't that the whole point of having public consultation as part of the review - to see what the NZ public thinks NZ's Defence Force should look like? Unfortunately I've got surprisingly few, I did find a handful from Tindal in 97 and a group photo of my shift taken at sunset at Mendle beach. Also a couple from Willow 98, including what must have been one of the few times 75 stayed in tents! A combat force? Nae chance. The current air force doesn't have the infrastructure, the manpower, the facilities, the capability, what else do I need to list. This isn't a simple matter. Ressurecting such a thing would now require huge effort in terms of training, re-establishing what was disestablished, refurbishing airfields etc etc... Not impossible, but money no Treasury is going to allow to be put forward for the Defence Budget. Politicians have three-four years to prove themselves to the Great Unwashed - this kind of investment would have to run waaaay beyond a mere term or two in parliament. Also, we've had our chance for cheap fighter aircraft; unfortunately there isn't much option available to us in terms of equipment (unless we buy second hand MiG-29s from the Russkies) - and don't even mention resurrecting the A-4s. We could buy the RAAF's F-18 Classics once the Supers and the JSF arrives there? Hows about buying one of the UK's Harrier Carriers and their Sea Harriers sitting about at Yeovilton? There is another - slightly off centre option - what about a contract Defence Force? Privately run and funded - peopled by mercenaries and the like. Worked for South Africa; anyone heard of Executive Outcomes? If you can scan them Phil that would be great. The 1998 tented one would have been at Rockhampton not Williamtown wouldn't it? I was on that one too. We went to Williamtown as well on the same trip I think but stayed in barracks at Williamtown and operated out of the ORP revetments way out in the middle of the airfield. Yes it was Rockhamption. We stayed in barracks at Williamtown for the first two weeks (while it rained almost the whole of the first week) and then the second two weeks were operating out of Rockhampton. We didn't operate out of the revetments on that one though, we operated out of the 77SQN (or was it 3 SQN?) line. Working under their 'car ports'. They were away somewhere so we used their facilities. I recall having to lock up their hangar after night shift. The previous trip to Tindal had us operating out of the OLAs because we were doing HE, but at Williamtown all we were doing was CDS, which we armed/dearmed just as they got to the edge of the line. There is a picture of a group of us (me, Demis Flanagan, Chris Ray and the admin clark who's name escapes me) sitting around a small inflatable paddling pool in front of the tents at Rockhampton. Is that you facing the camera? The bird was "Dubby" who was an ACFT Tech CPL doing the TCPC paperwork. Cpl Chris Ray Avtech on the right. The other guy sitting beside Dubby was an Avionics Mech but I can't remember his name. It's not the exact frame I have, but it's taken within moments of it. I think the shot I have has everyone looking at the camera and is more square on to the tents in the background. 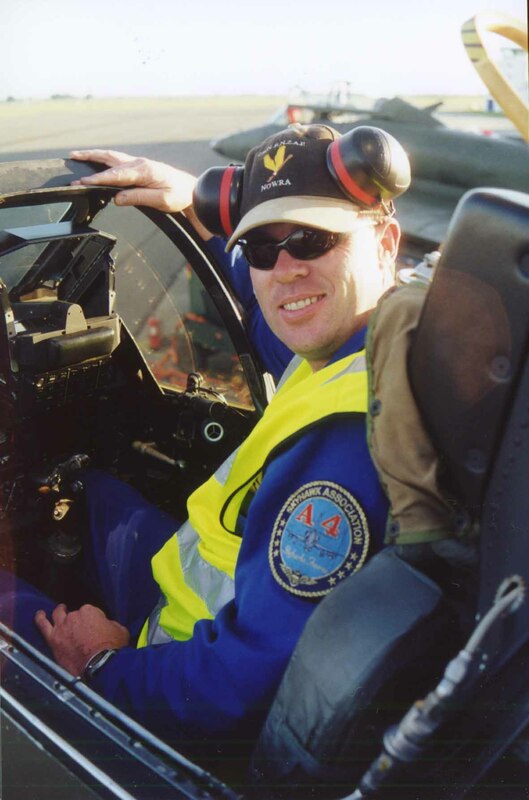 The Avionics Mech is Demis Flanagan who I joined up with and was last heard of living in California. And yes, that's me facing the camera. its interesting to see many pecimistic comments were written on this topic! Fair enough though you are probably all right in your thinking, however I dont think we should be worried about how the RNZAF would reestablish a strike wing, fact is if it is deemed necessary it will happen. Looking at this thread reminds me to rat through my photos of the 75sqn deployments i went on.